When efforts by state Sen. Wendy Davis, D-Fort Worth, and other Senate Democrats to run out the clock on an abortion bill fell short, protesters made enough noise to grind the Senate chamber to a halt. 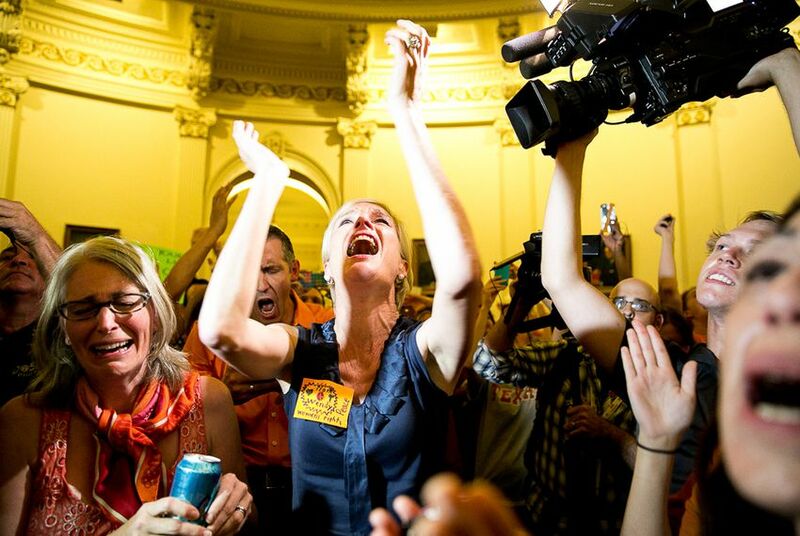 Minutes before midnight in the Texas Capitol on Tuesday, thousands of protesters stopped a restrictive abortion bill in its tracks by yelling at the top of their lungs. The remarkable and surprisingly successful moment had not been planned by the established groups like Planned Parenthood, NARAL Pro-Choice Texas and the Texas Democratic Party that had done much of the organizing for the protests against Senate Bill 5. Instead, it grew organically with the help of a smaller coalition of groups — including local chapters of the Occupy movement and the International Socialist Organization, or ISO — that helped goad the crowd to a level of civil disobedience not seen in the Texas Capitol in decades. Reproductive rights activists had spent nearly a week coming to the Capitol to protest abortion restrictions proposed by Republican lawmakers during a 30-day special session called by Gov. Rick Perry to address a handful of disparate issues. The version of SB 5 that reached the Senate on Tuesday — the last day of the special session — included a ban on most abortions after 20 weeks of gestation and a requirement that abortion facilities meet the standards of an ambulatory surgical center. Opponents predicted the bill would lead to the closing of nearly all of the state’s abortion facilities. Davis drew significant national attention by drawing out the filibuster for 11 hours, at which point the Senate’s Republican leadership successfully employed parliamentary maneuvers to end it. Throughout the day, the Capitol had slowly filled with protesters, the vast majority of whom were opposed to the legislation. By the time Davis had ended her filibuster, after 10 p.m., thousands were crammed into the picturesque rotunda and in the halls near the Senate gallery, some of them having traveled in from around the state. “I know people who drove up from Houston for it after work,” added state Rep. Jessica Farrar, D-Houston, who helped lead efforts to delay the bill’s passage from the House two days earlier. During the nine-hour debate before that vote and a drawn-out hearing the week before, protest leaders frequently squashed periodic outbursts from riled activists. Democratic officials as well as representatives with NARAL Pro-Choice Texas and Planned Parenthood said the goal at earlier demonstrations and throughout most of the day Tuesday was to show strength in numbers but to avoid confrontations that would get activists ejected from the building. “We were worried about getting cleared out earlier and not being able to be there for Wendy Davis,” said Heather Busby, the executive director of NARAL Pro-Choice Texas. The mood among many activists shifted late Tuesday evening as midnight drew near and the last-ditch efforts of Senate Democrats to stall the vote began to falter. Around 11 p.m., chants of “Wendy!” and “Kill the bill!” gained volume. “Our job as we saw it was to gauge the crowd and see what the potential was for taking things in the most radical direction possible,” said Katie Feyh of the Austin ISO chapter. Cecile Richards, president of the Planned Parenthood Federation of America, had staked out a spot in the center of the rotunda, not far from where a portrait of her mother, former Gov. Ann Richards, hung on the wall. She and others, including some Democratic lawmakers, could be seen occasionally gesturing to the crowd to quiet down. At 15 minutes before midnight, state Sen. Leticia Van de Putte, D-San Antonio, struggled to be recognized to speak by state Sen. Robert Duncan, R-Lubbock, who was presiding over the upper chamber’s proceedings. “At what point must a female senator raise her hand or her voice to be recognized over the male colleagues in the room?” she asked. Those in the Senate gallery erupted in cheers and soon began clapping in unison. A larger crowd just outside the Senate chamber’s doors joined in. The chain reaction spread to the rotunda, where thousands soon began yelling, most unsure what had prompted the latest outburst. Various activists began urging people to be even louder and to keep at it, with the hope of drowning out the Senate. At first, some people working with Richards could be seen making time-out gestures. After word spread from the Senate floor that the noise was effectively grinding the Senate to a halt, Richards began furiously pumping her arms in the air, signaling to all around her to get as loud as possible. The noise in the Capitol grew to a deafening roar. With every passing minute, activists put up fingers in the air to signify the minutes left until midnight. The Senate did not complete a vote on the bill until 12:03 a.m. At 3 a.m., Lt. Gov. David Dewhurst admitted that the bill was dead and blamed its failure on the protesters. Farrar disputed that characterization and argued that the protesters were responding in large part to the belief that Davis’ filibuster was inappropriately cut short.